Grown in the green heart of Austria, with each root having been unearthed and replanted several times by hand, to free the main root of unnecessary secondary sprouts giving this horseradish its unique freshness and quality. After a laborious cleaning process the sticks are grated using an innovative procedure and packed ready to make the journey to the shop and countless kitchens and restaurants. Its unique spicy flavour is best enjoyed when freshly grated. Can be used to add flavour to meats, fish, vegetables, casseroles, soups and salads – adding an extra spice to your meal. Since the Middle Ages, horseradish was considered as a “healing miracle cure” – credited with strengthening the body’s defences. Horseradish offers excellent Vitamin C benefits and offers protection against colds, mixed with honey relieves sore throats and aids metabolism and digestion. It also contains phyto-nutrients which gives it the spicy taste and offers cancer fighting benefits. 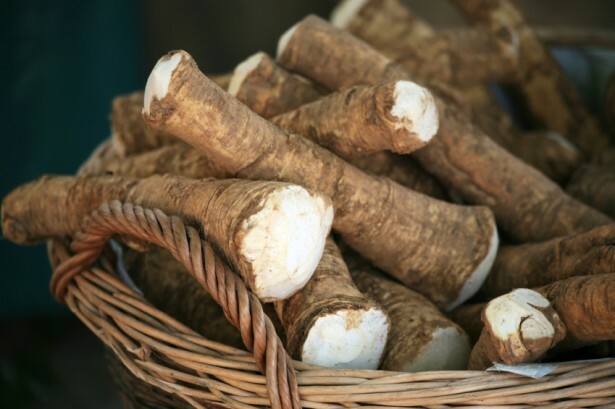 Horseradish can be used as a poultice to aid minor muscle aches, rheumatism, gout, insect bites, sciatica and other neuralgia.